The following article by Raúl Prada Alcoreza was originally published in the first issue (June 2008) of Crítica y Emancipación, a biannual Latin American journal of the social sciences. This translation from the Spanish, by Shana Yael Shubs and Ruth Felder, was published this year in a complete English-language version of the journal’s first issue. It was distributed at the recent congress of the Latin American Studies Association, held in Rio de Janeiro, Brazil in June. A review of the first issue of Crítica y Emancipación was published at http://tinyurl.com/nuk4jp. Among the many articles in that issue are a speech by Bolivian Vice-President Álvaro García Linera on the experience of Bolivia’s constituent assembly, “Catastrophic equilibrium and point of bifurcation” in a translation by Richard Fidler. It was published in Bolivia Rising (http://tinyurl.com/ns4wjf) as well as other publications. Also of interest is a speech by Rafael Correa, the President of Ecuador, evaluating the state of social sciences in Latin America. This article by Raúl Prada discusses the new draft constitution of Bolivia as it was adopted by the Constituent Assembly. It was written prior to the final round of negotiations with the parliamentary Opposition parties that resulted in the text ultimately adopted by popular vote in January 2009. However, few of the later changes affect the substance of Raúl Prada’s analysis; where applicable, they are indicated in the notes added here by Richard Fidler. In this article, the author analyses the characteristics of the new political constitution of the state, passed after Evo Morales took office as the president of Bolivia. This new con-stitution redefines the concept of the state as well as that of citizenship from a plurinational, multicultural and communitarian perspective. The development of liberal rights, obligations and guarantees is combined with grassroots indigenous claims, which are thereby included in the new legal and institutional framework. Hence, the notion of an interventionist, welfare state that protects natural resources takes shape, which incorporates the ways and practices of first peoples and nations into its institutional life. The state thus becomes a tool for equitable, sovereign and sustainable development. Raúl Prada Alcoreza - Professor and Researcher. Coordinator of Doctorate Studies on Epistemology at the Universidad Autónoma Gabriel René Moreno. Member of the Research Group La Comuna. PRADA ALCOREZA, Raúl. Analysis of the new political constitution of the state. Critica y Emancipación, (1): 35-50, June 2008. The characterisation of the Bolivian state as a social unitary state of plurinational and communitarian law is new; this broad and complex description is not found in the old constitution. The characterisation of the state is a thorny subject. It articulates the legal sphere with political urgencies, and the social unitary rule of law with its plurinational, community and intercultural nature, ratifying its condition as free, independent, sovereign and democratic. It is founded on plurality and pluralism that operate in distinct spheres: political, economic, legal, cultural and linguistic. It is based on the recognition of the pre-existence of the originary indigenous peoples and nations, which implies the recognition of their right to self-determination. The characterisation of the state offers a description of the Bolivian people in its diversity and multiplicity, identifying its multicoloured composition with respect to nations, classes(1) and social strata, scattered around the cities and the countryside. The characterisation of the state describes a democratic and participatory government, and opens up multiple types of direct, universal and communitarian representation. It also combines the cultural values of originary peoples and nations with liberal principles. This composite understanding of the characterisation of the state includes liberal constitutional developments and is enriched by the indigenous contributions of new constitutional and political forms. One might say that the new political constitution of the state is a constitution in transition. It is the passage from a social and unitary state to a plurinational one; from a state that gave up on federalism after the war at the end of the 19th century and the beginning of the 20th (called the Federal War) and chose unitarianism. A state that, after the Chaco War, built a populist state, consolidating it as a Latin American-style welfare state during the twelve years of the National Revolution (1952-1964). The unitary and social nature of the state, then, is a legacy of the past. This is how Bolivia approached modernity. What is new in the new constitution is its plurinational and communitarian nature, its administrative decentralisation and its system of autonomies. Its plurinational nature is related to a decolonising dimension that points to the deconstruction of the republican, colonial and liberal state. It is related to the recognition of the existence of originary, indigenous nations prior to colonisation; that is, the recognition of the demographic matrix of the Bolivian people. 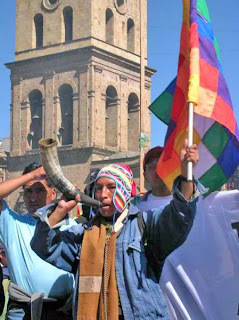 Bolivian people are noteworthy for their ethnographic and sociological diversity. State pluralism, which is also a pluralism of nations, is a substantial improvement in democratic pluralism, constructed on the basis of collective identities and political communitarianism. The communitarian nature of the new constitution is based on the recognition of the cultural institutions that give form to the behaviours not only of rural communities, but also urban ones. We speak about the ayllus, the tentas, the capitanias, the organising structures that give meaning to migration, migrant settlements, holidays, festivals, challas, rituals and ceremonies, where collective symbolism lies. An initial conclusion could be the following: the new constitution represents a transition from the unitary and social nature of the state to a plural-national and communitarian one. It is also a constitutional transition, as developments in liberal rights, obligations and guarantees are combined with constitutionalised indigenous demands, and with legal and political forms that give a constitutional framework to the process of nationalisation and recovery of natural resources. In other words, it does not cease to be a liberal constitution, albeit in a pluralist version, incorporating four generations of rights: individual rights, social rights, collective rights and environmental rights. It is also an indigenous and popular constitution in that it incorporates the indigenous nations’ and peoples’ own institutionality, their own structures and practices. In the same way, it is a constitution that recognises the fundamental role of the public realm as an interventionist, welfare and industrialising state. This combination of pluralist liberalism, originary indigeneity and plurinational statism constitutes the juridico-political transition. A second conclusion is the following: the new institutional map is a combination of liberal, indigenous and popular forms, in the context of a welfare state. The text of the constitution has five parts: characterisation of the state, rights, obligations and guarantees; functional structure and organisation of the state; territorial structure and organisation of the state; economic structure and organisation of the state; and hierarchy of norms and constitutional reform, containing the transitional provisions. The first part constitutes the dogmatic part of the constitution and the other parts, except for the last one, constitute the organic part of the constitution. The characterisation of the state declares that Bolivia is a social unitary state of plurinational communitarian law, free, independent, sovereign, democratic, intercultural and decentralised, with autonomies. With respect to the principles, values and goals of the state, sovereignty is said to reside with the Bolivian people and is exercised directly. Article 8 combines Andean, Amazonian and Chaquenean principles and values with democratic principles and values; immanent cultural symbols with transcendental political meanings. Gender is an axis that cuts across the entire document, as do the plurinational and communitarian axes. This renders new subjects and subjectivities constitutive of the new political form. The subjects of gender—above all, female subjects—the diverse subjects and subjectivities of plurality, and collective subjects emerge as new imaginaries and actors in the new settings of a new political horizon. This lends a molecular dynamic to the institutional machinery and political mechanisms. It is not that other subjects, the classical subjects of modernity, have disappeared, but they now appear in new settings illuminated with the colours of a plurality of forms. The plot is different, and therefore, so are the expected outcomes. Representation is opened up in various ways; it is direct and participatory, through universal suffrage, and communitarian, in accordance with different norms and procedures. The representative world is in harmony with the pluralism of the types of representation and the diversity of subjects, individualised and collective, those that are female and those from the communities. It also speaks about the different forms of democracy: representative, direct and communitarian. Democracy goes back to the evolution of political action and to the primordial form of deliberation: the assembly. The monopoly of the political class is thus broken, politicising the working of all spheres of social action. Democracy is no longer for the few, but for the many. The many exercise their majority dialectically with the minorities, in a dialectic in which different interests and perspectives are made visible, in a place where political synthesis can take place. In the new constitution, rights are divided into those that are exceptionally fundamental, like an acquisition in the evolution of rights, in addition to fundamental rights and constitutional guarantees. Among the exceptionally fundamental rights are the rights to life, water, nourishment, education, health, habitat and housing, and access to the basic services of potable water, sewerage, electricity, household gas, postal services and telecommunications. These rights can not be suspended for any reason, not even a state of siege. In the new constitution, fundamental rights are civil and political rights, those of originary indigenous nations and peoples, those of peasants, social and economic rights, the right to a healthy, protected and balanced environment, the rights to health and social security, to work and employment, to property. Fundamental rights include the rights of childhood, adolescence and youth, as well as those of older adults, people with disabilities, people deprived of their liberty, and users and consumers. Education is conceived of as intercultural, and cultural rights are also considered. Section IV is dedicated to science, technology and research. There is also a chapter on social communication. Rights do not remain a mere declaration; they are reinforced with constitutional resources, so that they will be unfailingly fulfilled. Guarantees include jurisdictional guarantees, defensive actions, such as the actions of freedom, the protection against the infringement of fundamental rights and freedoms, of constitutional protection, of privacy, of unconstitutionality, of fulfilment and popular action. States of exception are discussed, and citizenship is defined. It is noteworthy that the declaratory aspect of the constitution forms a part of the most advanced constitutionalism, of the greatest liberal traditions, including the development of communitarian liberalism, and of the greatest social traditions, including all of the conquests of the social classes, sectors and strata. In addition, the difference between the exceptionally fundamental rights and the fundamental rights is emphasised and made visible, demonstrating that social and collective rights and those related to life and to the environment are not of a lower rank than individual rights, but rather that they are equivalent. What is emphasised here is the value of these rights of second, third and fourth generation. The constitution states that education is a supreme function and primary responsibility of the state; state and society must protect and defend the education system. Education is unitarian, public, universal, democratic, participatory, communitarian, decolonising and of high quality; education is intracultural, intercultural and plurilingual. (2) This is all part of the transversality of the plurinational state. In other words, social integration is built upon a recognition of diversity; different sectors must act and interconnect, the groups that make up new subjectivities must become articulated and differentiated, forming a multicoloured social formation. It is said that the tongue was created in order to speak with others, with those who are different, of other tongues. The incorporation of plurilingualism substantially enriches the circulation of knowledge and the open formation of world views. These new experiences in alternative formative spheres open up possibilities that are constitutive of new subjectivities and understandings based on ductile and original paradigms. Education within a single paradigm—constructivism, which has been dominant—can no longer be sustained. Possibilities of speech open up through new instruments of expression, possibilities of visibility open up through new corporal agencies. It is therefore crucial to ensure that any new paradigms revolve around flexible and open educational experiences. The second part of the state’s new political constitution addresses the functional structure and organisation of the state; that is, the structure of the organs of the state. This structure involves four organs: legislative, executive, judicial and electoral. However, if we consider the structure of other organs of the state, we find social control, which forms a type of “fifth power”, in addition to the four preceding “powers”. It is said that when we speak about organs, we are referring to a metaphor of the state body from a holistic perspective, while when we speak about powers”, we develop an understanding of the balance between them. This begins with the theory of limits and mutual control of the powers, avoiding concentration in any one of them. Both the holistic perspective of organs and the “power” balance perspective are parts of the liberal paradigm, even though one is built on an organicist model and the other on a model of equilibria. Exaggerating somewhat, it could be said that the view of the “powers” of the state is more liberal than the organicist view; however, both discourses talk about the same thing: the organisation and structure of the state. The difference from the prior state project, as outlined in the previous political constitution of the state, is that, in addition to increasing the number of state “powers”—instead of three there are now four or five—the plurinational and communitarian nature runs throughout the structure of the new constitution. Another transcendental step is the move from representative democracy to participatory democracy, constituting a social “power” with the constitutionalisation of participation and social control. The new constitution describes a plurinational, bicameral assembly, with indigenous representation via universal suffrage. This organ or “power” elects uninominal and plurinominal representatives. The Chamber of Deputies will be made up of 121 members,(3) elected on the basis of territorial and demographic criteria, in uninominal districts. Seats will be assigned through a system of relative majority. The Chamber of Departmental Representatives(4) will be made up of four representatives per department, elected by plurinominal, departmental constituencies, assigned through a system of proportional representation. The new constitution describes an executive organ, also plurinational, as the political mechanism that brings together the political will and action of the plurinational and communitarian nature of the country. The judicial organ is constituted on the basis of the complementarity of two types of law: formal, “occidental” and ordinary law, and communitarian law, which, despite its practical nature, has a different formality and ceremoniality and a different set of values. The complementarity of the two systems proposes a dual articulation; it enriches and expands the ways of administering justice, establishing a point of connection in between the two in the courts, which will share a plurinational and intercultural nature. The constitutional court is plurinational and intercultural, thus guaranteeing the proper interpretation of both systems, and their combination. The electoral organ is also plurinational in its composition, and is responsible for organising, administering and executing the electoral processes. The territorial structure and organisation of the state shapes the system of autonomies, and is responsible for the process of administrative and political decentralisation. It therefore defines the change in the country’s political geography. There are four types of autonomy: departmental, regional, municipal and indigenous. The departmental, regional and indigenous forms of autonomy are new, while municipal autonomy persists since the Law of Participation of municipal autonomy, it is the legacy of the system of autonomies. With such administrative and political decentralisation, autonomous territorial entities are not dependent upon each other and they each have equal constitutional rank. Those departments where the “No” vote won in the referenda on autonomy are not autonomous. They are decentralised, and they may become autonomous via a departmental referendum. Much has been said lately about departmental autonomy. There are those who would like the only type of autonomy to be departmental, which would be very limited when confronted with the demands of an open and multiple decentralisation process. The autonomous system must be complex and integrated, which means that it must recognise different possible types of autonomies. Included in these possibilities is regional autonomy, which implies a process of greater decentralisation, incorporating local forms of management, which make it more functional and democratic. The struggle against centralism does not only imply a decentralisation from the central state. It also means decentralising from other centres, including the capital cities of the departments, where economic powers, dominant classes and monopolies of financial circuits are based, and from where large rural estates are administered. Regional autonomy is conceived of as part of a move to a new territorial structuring. This autonomous dimension is made up of provincial and municipal communities. The various types of autonomy have their differences; in addition to occupying different spaces, they do not all have the same history, nor are they part of the same organising structures. These differences become clear in the distinction between their types of government and in their distinct competencies. The government of each region will consist of a Regional Assembly with deliberative, normative, administrative and investigative power in the sphere of its competencies, and an executive organ. The government of each autonomous department will be made up of a Departmental Council,(5) with deliberative, investigative and legislative normative departmental power in the sphere of its exclusive competencies, as determined by the constitution and an executive organ. Autonomous municipal governments will be made up of a Municipal Council with deliberative, investigative and legislative normative municipal power in the sphere of its exclusive competencies and an executive organ. Originary indigenous peasant autonomy is the expression of the right to self-government, understood as the exercise of the self-determination of originary indigenous nations and peoples and peasant communities whose population shares territory, culture, history, language and its own legal, political, social and economic organisation or institutions. Of the four axes of the plural economy, the communitarian one receives special attention due to its long history and the role it plays in the conditioning and direction of the behaviour of the majority of the population. The community continues to be the strongest reference point in bartering circles, fairs, collective work, ayni, minka, the underlying complementarity between different ecological floors and the reciprocity between communities. The state will recognise, respect, protect and promote community economic organisation. This type of community economic organisation includes the systems of production and reproduction of social life, founded on the principles and vision of indigenous nations and peoples and peasants (Art. 308). Another axis of special attention is the state. The strengthening of the state is sought at every level of the economic chain, but the state is no more than the administrator of the properties of all Bolivians. Thus, the state has the task of “administering the ownership rights of natural resources and exercising strategic control in the productive chains and industrialisation processes of said resources in the name of the Bolivian people” (Art. 310). The communitarian economy and the state economy are fundamental axes of the plural economy; they are promoted without damaging other axes, such as the private and cooperative economies. The private economy is part of an inescapable economic reality; it drives and manages a significant part of economic spaces. In this sense, “the state recognises, respects and protects private initiative, so that it may contribute to economic and social development and strengthen the economic independence of the country” (Art. 309). With respect to the cooperative axis, “the state recognises and protects cooperatives as nonprofit forms of work in solidarity and cooperation” (Art. 311). It is a duty of the state and the population to conserve, protect and sustainably exploit natural resources and biodiversity, and to maintain environmental equilibrium (Art. 342). that the population has the right to participate in environmental management, to be consulted and to be informed prior to decisions that may affect the quality of the environment (Art. 343). Natural heritage is of public interest and of strategic importance for the sustainable development of the country. Its conservation and use for the benefit of the population will be the exclusive responsibility and ascription of the state, and sovereignty over natural resources will not be compromised. The law will establish the principles and mechanisms for its management (Art. 346). I. Natural resources include minerals in all states, hydrocarbons, water, air, the soil and subsoil, forests, biodiversity, the electromagnetic spectrum and all elements and physical forces that may be exploited. II. Natural resources are of strategic importance and public interest for the development of the country (Art. 348). There is no doubt that natural resources are intimately linked to the environment. The type of exploitation of natural resources shapes the mode of development. Sustainability demands that the exploitation of natural resources be carried out with a proper balance between development and environment, between the development of production needs and biodiversity. The exploitation of natural resources in a given territory will be subject to a process of free, prior and informed consultation with the affected population, convened by the state. Citizen participation in the process of environmental management is guaranteed and the conservation of ecosystems will be promoted, in accordance with the constitution and the law. In the case of originary peasant indigenous nations and peoples, the consultation will take place respecting their own norms and procedures (Art. 352). From this we can conclude that proper balance must also be accorded to culture. Sustainable development, environment and culture comprise a triangle. Let us call this triangle one of sustainability with identity—sustainability with the participation of indigenous peoples. With respect to hydrocarbons, “the state will define hydrocarbon policy, will promote its comprehensive, sustainable and equitable development, and guarantee energy sovereignty” (Art. 360). I. Water constitutes an exceptionally fundamental right to life in the framework of the people’s sovereignty. The state will promote the use of and access to water based on principles of solidarity, complementarity, reciprocity, equity, diversity and sustainability. II. Surface and subterranean water resources in all states constitute finite, vulnerable and strategic resources, and fulfil a social, cultural and environmental function. These resources can not be subject to private appropriation and neither they nor their services can be privatised (Art. 373) (8). I. The state will protect and guarantee the use of water for life as a priority. It is a duty of the state, with social participation, to manage, regulate, protect and plan for the proper and sustainable use of water resources, guaranteeing access to water for all inhabitants. The law establishes the conditions and limitations for all its uses. II. The state will recognise, respect and protect the ways and customs of communities, their local authority and indigenous peasant organisations with respect to the right, administration and sustainable management of water. III. Fossil water, glacial water, wetlands, underground water, mineral water, medicinal water and others are priorities for the state, and their conservation, protection, preservation, restoration, sustainable use and holistic management must be guaranteed; they are inalienable, nonseizable and imprescriptible (Art. 374). I. It is the duty of the state to develop plans for the use, conservation, management and sustainable exploitation of hydrographic watersheds. II. The state will regulate the administration and sustainable management of watershed and water resources for irrigation, food security and basic services, respecting the ways and customs of the communities. III. It is the duty of the state to carry out research to identify and then protect, manage and sustainably use fossil water (Art. 375). We are also referring to populations with historical and cultural frameworks that entail alternative civilising possibilities to those of capitalist modernity. We refer to cultural norms in balance with the environment and biodiversity. These cultural norms are a part of ecology, of the dynamic ecology and the circles and circuits of ecosystems. But ecology is also a part of the cultural spheres of knowledge circulation and holistic world views that do not separate knowing from oikos, from the home, from the dwellings of the inhabitants, of all organic beings. We refer to indigenous peoples, then, not just as population and ethnos, but also as knowledges and practices. It is these techniques, these practices, these knowledges that must be recovered in worlds based on the proliferation of sustainability. Because there is not just one model of sustainability, but many, which are in line with the components of biodiversity. The difference with unsustainable development is the destructive and unbalancing capacity of development, of the process of modern evolution, in which natural conditions are separated from historical ones, ecological conditions from economic ones, abstracting natural riches as indefinitely exploitable resources, independently of ecological cycles and environmental balances. In contrast, sustainability is conceivable from the standpoint of a profound connection between natural and historical conditions, and between ecological and economic conditions. Sustainability may be conceived on the basis of a profound imbrication between social structures and ecological niches. 1. To the freedom to exist. 2. To their cultural identity, religious beliefs, spiritualities, practices and customs, and to their own worldview. 3. To have the cultural identity of each of its members, if so desired, noted along with Bolivian citizenship in identity cards, passports and other official identification documents. 5. To have their institutions form a part of the general structure of the state. 6. To the collective ownership of lands and territories. 7. To the protection of their sacred places. 8. To create and administer their own communication systems, media and networks. 9. To have their traditional knowledges, their traditional medicine, their languages, rituals, symbols and clothing valued, respected and promoted. 10. To live in a healthy environment, with appropriate ecosystem management and use. 11. To the collective intellectual property of their knowledges and sciences, as well as their appreciation, use, promotion and development. 12. To intracultural, intercultural and plurilingual education throughout the educational system. 13. To free and universal health care that respects their world view and their traditional practices. 14. To the exercise of their political, legal and economic systems in accordance with their world view. 15. To be consulted through appropriate means, especially through their institutions, whenever legislative or administrative measures may affect them. In this context, the right to binding prior consultation with respect to the exploitation of nonrenewable natural resources in the territory they inhabit, carried out by the state in good faith and agreed upon by consensus, will be respected and guaranteed. 16. To enjoy the benefits of the exploitation of natural resources in their territories. 18. To participate in the organs and institutions of the state (Art. 30). The new political constitution of the state, then, comprises originary indigenous nations and peoples not only as fully recognised populations, cultures and knowledges, but also from the perspective of rights. Not only is there a declaration of collective rights, but there is a specific chapter dedicated to the rights of the Originary Peasant Indigenous Nations and Peoples. Indigenous nations and peoples are part of the structure of constitutional rights—they are a structuring element in the structure of the new constitution. (2) But see articles 86 and 87 of the final draft, which were amended to provide constitutional protection to faith-based education and recognize a right of “religious entities” to administer schools. (3) Now 130 members (article 146.I). (4) Now Senators, four per department making a total of 36 (article 148.I). (5) Now Departmental Assembly (article 277). (6) The final amended draft adds the words “legal security”. (7) The articles in this section of Raúl Prada’s text are now renumbered slightly in the adopted draft. This paragraph is now article 306. (8) The final draft adds the phrase: “and are subject to a regime of licences, registration and authorizations in accordance with the law”. (9) Added to this paragraph 17, in the final draft, are the words “without prejudice to the rights legitimately acquired by third parties”. For various views of this and similar changes, see Andrés Soliz Rada, “Bolivia: Constitution and Hydrocarbons”, http://tinyurl.com/nsevn2; Hervé Do Alto, “Bolivia: Compromise Agreement Allows Progress”, http://tinyurl.com/nzlnqa; and Álvaro García Linera, “We are going through the most radical experience of transformation in the continent”, http://tinyurl.com/m2oqgv.